Humidification can be a costly element of an air-handling system to run and maintain. As humidification specialists we are often approached by facilities managers wanting to reduce their humidifier running costs. Up until recently contractors have typically installed electrode boiler humidifiers when specifications called for humidification. These units are economic to buy and easy to install. However, this type of humidifier has a high maintenance requirement as the boiling cylinders need replacing when they become caked in lime scale. They also have high electrical consumption, which when combined with the maintenance cost, sometimes leads to the humidifiers being turned off resulting in poor environmental control and a waste of the initial investment. The continuous effort to reduce energy consumption has resulted in newer buildings incorporating air handling units with low energy cold water humidifiers rather than electric steam humidification. However, retrofitting cold water evaporative or spray humidifiers into an AHU that previously accommodated an electrode boiler humidifier can be difficult. This is due to the larger space required in the duct and the fact that cold water humidifiers often demand alterations to the heating coil so that the cooling effect of the evaporating moisture can be counteracted at times of the year when it isn’t desirable. These issues can make the replacement of electric steam humidifiers with low energy cold water humidifiers unviable. So is there an alternative for the long suffering facilities manager who is currently using electrode boiler humidifiers and wants to reduce the energy and maintenance costs associated to his HVAC system? Gas-fired humidifiers offer steam humidification at a third of the energy cost of electric humidifiers, don’t incorporate disposable boiling cylinders so are cheaper to maintain and can easily be retrofitted into an existing electric steam humidifier application. The humidity control offered by gas-fired humidifiers is good and capacities range from 40 to 240kg/hr from a single unit. They can even be connected to the existing steam lance pipework resulting in minimal disruption to operations during the installation. Although electrode boiler humidifiers do require frequent costly spares, they are relatively simple to maintain, as when scale builds up, as it will do in any steam humidifier, the boiling cylinder is unclipped and replaced with another. In the past gas-fired humidifiers have suffered from being difficult to service. 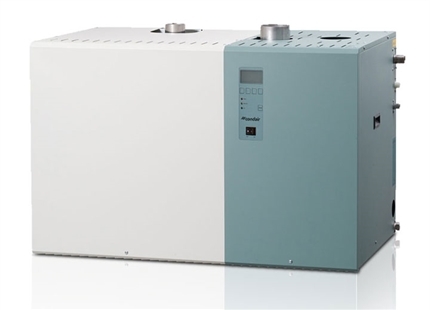 However, modern systems, such as the Condair GS gas-fired humidifier incorporate several features to make them maintenance-friendly. So if gas-fired humidifiers perform as well as electric humidifiers and are simple to maintain, how do the energy costs compare? To illustrate the economy and possible payback of retrofitting gas-fired humidifiers, let’s examine the costs of humidifying an average London office with 180kg of steam per hour in order to maintain a healthy environment at around 50% relative humidity throughout the building. Operating 12 hours a day, five days a week during the times when the unit would be required, given our climate and seasonal conditions, would equate to a full load running time of 1,321 hours per year. The typical purchase cost for an electrode boiler of this size would be around £5,000. 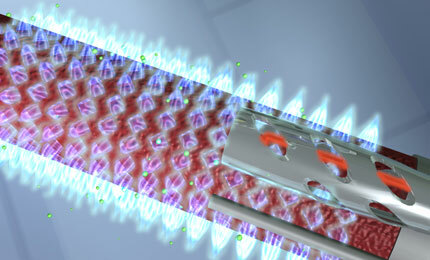 It would have a power consumption of 135kW per hour. The equivalent gas-fired humidifier has typical purchase cost around £20,000 and an hourly power consumption of 182kW. Based on electrical costs of 9 pence per kW, the energy cost of the electrode unit is £16,000 per year versus just £7,200 at 3 pence per kW for gas. The electrode boiler’s energy costs are over 2.2 times higher than the gas system. In addition to this, the maintenance required for the electrode system, including labour and service parts, is more than twice as much as the gas system - some £3,500 per year versus £1,500. Taking into account a ballpark installation cost of £2,000 for retrofitting the gas system, the year one cost of replacing the electrode system with the gas humidifier and operating it would be around £30,700. This compares to the annual running cost of the electrode system at £19,550. However, payback would occur at the end of year two, with annual savings thereafter of around £11,000. 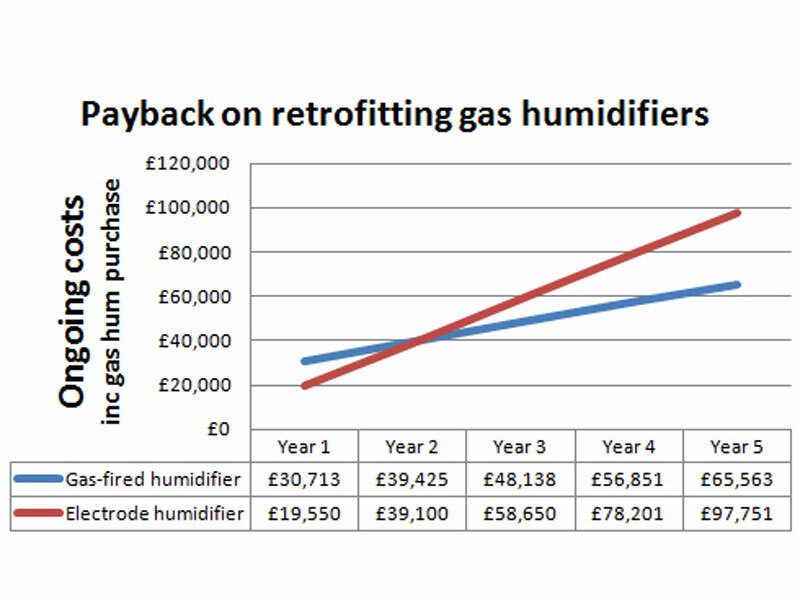 Over the first five years the total savings for choosing to replace the electrode system with a gas humidifier is over £32,000. Want expert advice from David about gas-fired humidifiers?